If we’re going to dedicate an entire guide to private and independent school fundraising, we should probably begin by defining the two types of schools. Let’s do that now! Although the difference between the two is minor, it still exists and needs to be pointed out. Private School: A private school is operated by a non-governmental agency. Private schools receive no funding from public officials or governmental entities. Independent School: An independent school is nonpublic and also not associated with a church or third party entity. The biggest semantic difference here is that independent schools cannot be classified as such if they’re governed by another agency, like a church, whereas a private school can be. Both, however, are nonpublic, and therefore have to rely heavily on fundraising. That’s where this guide will come in handy! The independent and private schools being discussed here are K-12. If you’d like some information on fundraising for universities and colleges, click here. Otherwise, your independent or private school likely relies heavily on its ability to raise funds from its community. Follow this 5-step guide and make the grade in your fundraising class this school year. It can sometimes be difficult to think of new and creative school fundraising ideas that will keep your whole community engaged, but following some best practices for school fundraising will go a long way to boosting your overall success. Keep reading to learn more! Has your mission shifted since the last time you had a goal-setting session? How can your fundraising efforts make the biggest positive difference in the education of your students? Where do you see the donations you gather being spent? Your answers to these questions are going to help you craft your strategy, a point we’ll get to in step two, but, more broadly speaking, they’ll also help you hone your story. In order to be successful, you’ll want an overarching fundraising story, one informed by your past accomplishments and driven towards specific future experiences. Each story should be as unique as your school is. You need an impetus for people to donate. That impetus starts with your story. Learn more about the uniqueness of the fundraising process at K-12 schools. What goal do you need to accomplish? This is the most general of your strategizing questions. You have to be able to answer this before you can move on to any of the others. Your goal setting was all leading up to this question. How much money do you need to reach your goal? You’re in the realm of fundraising. Trying to accomplish your goal without a specific dollar amount in mind is like trying drive to a new restaurant without the street address. You reach the general region, but it is highly unlikely that you’ll get to where you need to be. When do you need to reach your goal? Almost as important as setting that dollar amount, you also need to determine a deadline. That date will have a massive impact on the speed in which you’ll have to work and the depth at which you’ll be able to address various tasks. Which donors and prospects are you looking to for funds? Contacting all prospects and donors will turn up some donations. However, you have limited time and resources that would be better spent reaching out to specific people who have a higher likelihood of donating. It’s a far better return on your investment (ROI). Using tools like wealth screenings to help you identify your most likely prospects can help you distribute your resources effectively. What is the giving capacity of your donor and prospect pool? How you target your donors and prospects will change depending on their giving capacities. If you’re soliciting a major gifts candidate, that process will differ from the manner in which you’d solicit a donation from a monthly giving prospect. Each is worthy of your attention, but they simply require specific acquisition strategies. How are you going to solicit donations? Building from the two previous questions, your communication methodology will be based on the prospects you’re targeting. That’s why conducting prospect research is so valuable to your organization. By getting to know your supporters and alumni better, you’ll be able to create an outreach strategy that is the most effective at reaching your goals. Some will respond to direct mail; others will need a visit. Maybe you’ll have the room in your budget for travel. Maybe you won’t. Plan smartly and budget accordingly, always keeping ROI in your thoughts. Consider, too, trying some school fundraising ideas that don’t require you to ask for financial donations. In-kind donation drives are a reliable staple for schools of all sizes. What additional support will you need? This question is essentially asking – what exactly is needed to accomplish this? That could be answered in many ways. You might need to put together a parent fundraising team, bring on a development consultant, or hold a training day for staff. Additional resources often come at a certain expense, so deciding what you’ll need throughout the process, and deciding early, is the best step you can take to handle the onslaught of tasks that come along with a fundraising initiative. The highly detailed strategy that you’ll generate while working through these questions is designed to be your school’s guidepost throughout the campaign. With this plan in place, everyone will know what their part in the process is and have ample time to figure out how best to accomplish their tasks. Learn about the tools you can use to research and answer questions like these. Make sure all involved know their roles and what is expected of them. Walk through any pertinent aspects of the strategy with any parties that it applies to. The good news is that you have this diverse team at your fingertips. The bad news (which isn’t really bad news) is that your network of fundraisers is going to need guidance and management. The sooner you can make expectations and guidelines known, the better your campaign will go. Schools constantly have new prospects. Every school year, as your school brings in new students, you’re also bringing in their parents, who are solid prospects. Screen these prospects sooner rather than later. Early screening of new parents will help you start your relationships with them on the right foot. We recommend divvying up the screenings into four segments throughout the school year. Begin by screening new parents in the late summer, prior to the first day of school. Over winter break, screen the families of any students who enrolled during the fall. Sometime around spring break, research the students who will start at your school the following year. Finally, take some time at the end of the school year to refresh your files on graduates and alumni. This division should help make the process much more manageable. Get creative with your research if you’re initially having a hard time finding valuable data. For instance, you might not have the names of certain new parents, but you will have the addresses of those students. You can screen the addresses and identify the property owners, aka the parents. Sometimes, ingenuity is key. Learn more about the role of prospect research. Alumni are valuable fundraising resources. The less accurate your data on them is, the less valuable they are as resources. You have to keep your data on your former students updated in order to make the most of their relationships with your school. Learn more tips for cleaning the data in your donor database. Prior to all of your events, screen your guest list. Your team should know who is coming and what those attendees’ giving capacities are. With that knowledge, your team will be able to take advantage of their limited time with each guest. Much of fundraising is about who you know. Once you’ve exhausted all the connections you have, look to those in your circle (board members, active donors, volunteers), and map out their relationships. One of your close allies might have a connection with a hard-to-reach major gifts prospect. Build on those ties to extend your reach. Don’t forget about the power of fostering a culture of fundraising. When discussing building a team, you could see the sheer magnitude of fundraising resources available to you. Not only do you have built-in fundraisers, you also have a built-in donor and prospect pool. Develop a community of giving, and reap the rewards. Make sure you have leaders to set a positive example in each donor sub-group: teachers, students, alumni, parents, and so on. Emphasize the necessity of fundraising for your school’s continued prospering. Keep your mission at the center of all your efforts. 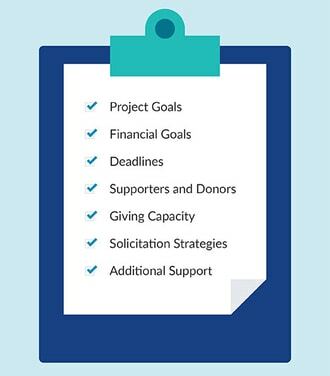 Ensure that donors know exactly what their funds will be accomplishing, and have a forum to allow them to express their own ideas for future efforts. Make sure content and donation forms can be easily accessed and viewed on mobile devices. Maintain a consistent brand throughout your school’s website. Focus on directing visitors to places where they can learn more about supporting your school. Don’t feel comfortable making big changes to your school’s website? No problem! You can always hire a website design company to handle all the technical work. Check out our list of top companies for more information. 1. Engage your students with a school auction. A family trip to Disney World. Auction off student artwork. Parents will love the chance to bid on their talented students’ creations, and your school won’t have to pay for the items. Solicit items from sponsors. Sponsors can offset the cost of auction items and support your school’s event. Plus, they can help advertise your auction through their marketing channels. Try a penny social. A penny social is an auction / raffle combo. Bidders purchase raffle tickets and place them in bowls next to each item. The more tickets a bidder puts in the bowl, the better their chances of winning the prize! For more information on hosting a penny social, check out this OneCause article. 2. Use live appeals for crowdfunding. A leader in the PTA. In a live appeal, the speaker requests that attendees donate to reach a fundraising goal. Then, attendees can either fill out paper pledge cards or donate via mobile devices. The latter option is the most modern and streamlined choice; all your school needs to do is find a crowdfunding platform that’s mobile responsive! Alternatively, you could invest in text-to-give or other mobile giving software if you have the budget for it. Regardless, you can check out these school fundraising ideas that pair well with crowdfunding to learn more about this lucrative strategy! 3. Host a family-friendly carnival. A location — If your private or independent school has a large enough field, you can host your carnival on campus. Don’t have enough space to fit all the games? Consider hosting your event at your community center or nearby fairgrounds. Rides and games — Carnival games and rides, the most costly pieces of any carnival, are essential if you want to provide guests with a fun experience. Ask local businesses to sponsor your rides so that you can cover some of the costs. Food — No carnival is complete without traditional state fair treats. To bring food to your carnival, invite local restaurants and food trucks to participate. For a small fee, they can set up shop at your event. Or you can ask them to donate a percentage of the money they make to your cause. An additional essential part of hosting a carnival is having plenty of volunteers to manage the games and make sure guests are having a fun time. Whenever hosting a large-scale community event like a carnival or fall festival, always consider ways to incorporate other fundraising strategies, too. For example, host a fundraising collection drive and provide free admission or ride tickets in exchange for the suggested in-kind donation. This strategy addresses two goals — increasing attendance to your event and collections for your drive! Encourage students, parents, teachers, and community members to attend your fundraiser by sharing the event details on social media, asking your local newspaper to cover the carnival, and posting flyers around the school and neighborhood. 4. Sell t-shirts and merchandise during your event. T-shirts can be branded. It’s easy to customize t-shirts and other clothes with your school’s name, mascot, and colors. Whenever students and supporters wear their shirts, they’ll instantly be connected to your school! T-shirts are useful. T-shirts can be worn at sporting events and on school spirit days. They’re a great way to band your student body together, and supporters will be eager to buy something that they can use in their daily lives. T-shirts appeal to all kinds of people. Anyone can purchase a t-shirt to support your school. Plus, they appeal to all age groups and grade levels! When planning your t-shirt fundraiser, make sure you’re choosing the right manufacturer. Not all t-shirt websites are built for fundraising. Look for a website like Bonfire that offers fundraising-specific options, like the opportunity for supporters to donate more than the cost of your t-shirt when they place an order. Though t-shirts are a great example of merchandise that can add oomph to a fundraising event, there are plenty of school fundraising ideas to choose from! Ultimately, fundraising events have tons of potential to help your school raise more. 5. Raise money with a shoe drive. Looking for an inexpensive way to raise funds? A shoe drive is a great school fundraising idea! Hosting a school shoe drive is so effective because everyone has a pair of shoes they can part with. Plus, kids outgrow shoes so quickly; families likely have several pairs of shoes to donate. What’s more, your shoe drive doesn’t have to be limited to parents and students. You can get the whole community involved in supporting your school. Just set up shoe drive drop-off areas around the community and start collecting gently used footwear. To make this fundraiser even easier, your school can work with a shoe drive organization like Funds2Orgs. Once you’ve collected all your donated shoes, Funds2Orgs will pick them up and send you check based on the number of pounds you collected. It’s that easy! Planning a shoe drive doesn’t require much effort or a huge budget, and your school has the potential to make thousands of dollars that can go directly toward your school. 6. Collect pledges before the event using team fundraising software. Engage students, parents, and community members in the time leading up to your event by collecting pledges with team fundraising software. This software solution is well-suited to walk-a-thons, bike-a-thons, dance-a-thons, and other similar fundraisers in which participants collect pledges based on the units of distance or time for which they participate. If you’re working with older students, event-a-thon fundraising software gives them the opportunity to take the lead in fundraising efforts. The software automatically generates individual donation pages that they can share via email, text, and social media with their friends and family to collect pledges. Want to encourage a little friendly competition? Look for an event-a-thon software solution, like that provided by 99Pledges, that allows the teachers or parents leading the fundraiser to track the progress of individual participants as well as groups. Motivate participants by rewarding the class or team that raises the most in pledges prior to your event! When your school’s fundraiser concludes, your event-a-thon fundraising software will send you the proceeds from your pledge drive. Especially for students and parents who are social media-savvy and eager to share their donation pages, this is an easy and highly effective fundraiser! DonorSearch’s Guide to Wealth Screening. Wealth screening can help you identify and target your most promising donors among tons of student and alumni data. Learn more! Fundly’s Guide to Donation Requests. This resource can help you teach students and faculty how to ask for donations during a fundraiser. Snowball’s Guide to Online Donation Forms. Does your school accept online donations throughout the year? You should! Learn how to create awesome donation pages. DonorSearch’s Guide to Fundraising Consultants. Do you need help building a fundraising strategy for your school? Learn how to find a consultant who can help you raise more. With all steps complete, you’ll be positioned for private and independent school fundraising success! You’ll end the year on the honor roll.